Bucket-O-Coins is the worldwide coin reference designed for the frequent traveler. 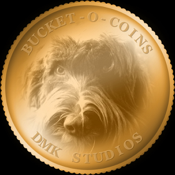 Bucket-O-Coins will make it easy to tell your coins apart maximizing your ability to use them! Bucket-O-Coins makes it easy to determine the value of your foreign change with a fully integrated currency converter. Going back to the same country again? Bucket-O-Coins will make it easy to find your foreign spare change and use it. Got a layover somewhere you've been before? Bucket-O-Coins will ensure you have some spare change in your pocket when you’re just passing through.